I mean when you think of it, it's kind of creepy. Facebook is the 21st century diner or malt shop. It's where teens and young adults go to hang out. And the last thing they want is some salesperson coming up in their face and trying to have a "conversation" with them while they're figuring out when they're going to the movies. They don't want to talk to you. They want to talk to their friends. There's a prominent real estate family here in New York City called the Lefraks. About 10 years ago, they decided to change the family name to LeFrak. And I remember thinking to myself at the time "Who do they think they're fooling? I mean do they really think that all these society types are going to see the new name, slap their foreheads and say "Oh, so they're French! All this time I thought they were Jewish, but they're really French! Muffy, quick, now we can invite the LeFraks over to the club." Well I get the same feeling about advertising agencies these days. We're sales people. We sell our clients products. But suddenly nobody wants to be a salesperson anymore. They're into "conversation." And consumers, I've now learned, aren't consumers anymore. They're "friends." But really people, who are you fooling? Your Brand Is Not My Friend™. Look. When I was 23, a site like Facebook would have been my second home. Keeping track of the daily comings and goings of my 100 closest friends? Check. Comparing our tastes in music, movies, books, photos, and travel destinations? Check. And when I wasn't on Facebook, I'd have been Twittering everyone I knew that I was going to the store. And then leaving it. With a middle Twitter to let them know that the cashier was being way too slow. And while I was busy Facebooking and Twittering, the absolute last person I'd have wanted to hear from is an advertiser. I mean when you think of it, it's kind of creepy. Facebook is the 21st century diner or malt shop. It's where teens and young adults go to hang out. And the last thing they want is some salesperson coming up in their face and trying to have a "conversation" with them while they're figuring out when they're going to the movies. They don't want to talk to you. They want to talk to their friends. The whole appeal of social media sites is their independence from corporate advertisers. People like the fact that they can say whatever they want to their friends without any interference from anyone or anything that seems "official" or "corporate. "Yes, they'll tolerate banner ads or search ads on the page, the same way that in the diner they tolerated placemats with ads on them or a Coke sign on the soda machine: that sort of advertising is innocuous and quickly becomes part of the scenery. Now there are some brands–I call them Prom King Brands–that people don't mind "conversing" with, so long as they can do it in the brands own space (as opposed to MySpace.) These are the brands that have somehow managed to build a better mousetrap, but there are no more than a dozen of them and you here on DailyFix can probably name them all by heart (I'll start: Nike, Apple, Starbucks, Virgin, Whole Foods– ) Sports teams, TV shows, rock bands and movies fall into this category as well. The rest of you are out of luck. You're not a Prom King and people aren't lining up to hang with you. So while Starbucks could probably start a Frappuccino Lovers Group on Facebook (for all I know, they already have), no one's going to be joining a Maxwell House Lovers group anytime soon. 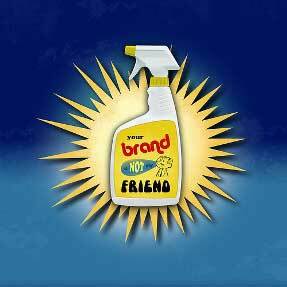 So if Your Brand Is Not My Friend™, does that mean you should run screaming from Web 2.0 and Social Media? All it means is that if you're not a Prom King brand, you need to be smarter about how you use the space. Not to mention more authentic. Let's take the Maxwell House example. The one thing we know about Maxwell House (other than that it's "good to the last drop") is that it's cheap. Very cheap, actually, in comparison to Starbucks. So you go on Facebook and find the Cheapskate Lovers group. And approach them as a salesperson. Not as a friend. Your script goes something like this: "Hey Cheapskates. Maxwell House knows how much you guys love saving money. And while our coffee is cheap enough as it is, if you go to this special Facebook Cheapskates site, we've got a dollar off coupon waiting for you." There's a critical difference here: if you're a Prom King, you define the interaction. People come to you to talk about and be around Starbucks, to get some of the halo effect of a brand they consider very cool. And even though you're selling them big time, you can pretend it's all just a fun little "conversation." But if you're a regular brand, you need to find a situation that fits your strengths. So if your strength is you don't cost a whole lot, you need to find a bunch of Cheapskates and then adapt yourself to their needs. And you absolutely have to do it as a salesperson. Because you can't ever pretend you're doing anything but selling them. And if you do all that, they may actually start to like you for it. To let you hang around more often and maybe, just maybe, they'll start talking about you. Not to you, but about you. Which at the end of the day, is a lot more valuable than having them talk about your TV commercial. Hence the value of social media.